Careful, now, as you enter the building, you don’t want to attract the attention of the guards. We all need to get in here, find the safes, get the loot, and get out. We’re not leaving anyone, or anything, behind. Like the three musketeers, it’s all-for-one and one-for-all, with Burgle Bros.
Burgle Bros. is a cooperative heist game for 1–4 players. The game starts with the first player entering the building. Then, you have to find the safes, crack them, gain the loot, and escape to the roof. The premise is simple enough, which makes the game entertaining to play. A friend and I sat down with Burgle Bros. and jumped right into the basic game. We decided to skip over the introduction scenario. The rules were easy to understand and we were able to set the game up quickly. The basic scenario is 16 randomly placed room tiles making up each of the three floors. Each floor has a safe and stairs. Other rooms contain obstacles and hazards you have to overcome, but you don’t know what the room is until you peek into it, or move into it. Once you find the safe you have to crack the combination. The combination for each safe are the numbers located on the cards in the same row and column of the safe. This means you have to explore the floor to uncover the combination before you can crack the safe and gain the loot. And, in the base scenario there are three floors you need to cover, then find the stairs to the roof and escape. Besides the obstacles in the rooms, you also need to watch out for the guards. Each floor has a guard on patrol. After each player takes their action the guard on the floor they finish on moves. This led to some strategy (suggested in the rules) to dividing up a little so one guard wasn’t moving too fast in making their rounds. But running into a guard doesn’t mean the end of the game. Every player has three stealth tokens allowing them to hide and not get caught. But if a player gets caught, the entire crew gets caught. This isn’t one of the games that has an element of sacrificing someone for your own win. You win or lose as a team. The team is drawn from nine character cards, determined randomly. Each player can chose one of the two skills the character has for the game. It’s good to know who else is on your team for the job and what skill they have. When you chose your actions for your turn other people’s skills can be as important as your own. On your turn you have several actions to choose from. I’ve already mentioned Peek and Move, You can also Hack (an alarm system), Crack (a safe), make it easier to crack a safe, or, save a couple of actions to draw an event card. Hacking an alarm allows you to move through the building easier by not setting off a particular type of alarm. There are five different types, each requiring you to do something different to not set it off. Safe cracking allows you to gain the loot and a tool. The loot you have to get out of the building, and a tool is just that, something that will help you get the job done. Event cards are unforeseen events that change the play of the game, either at that moment or later. Some of the events are beneficial, while others may cause some serious reworking of your plans. As you progress through the game, going up in levels of the building and cracking open the safes, the game becomes harder, making teamwork even more important. Our game lasted about an hour. Adding a couple of more players probably wouldn’t have extended the game much longer. The play was well balanced and turns moved quickly. Replay-ability for Burgle Bros. is high. The unknown layout of the rooms, the characters in play, the location of the guards and their patrol routes, are all determined randomly. It would be hard to come across a game layout that duplicated an earlier one you play. The loot, tools, and events add another level of the unknown. There are also suggested advanced rules and other scenarios. The components of the game should stand up to the challenge of being played multiple times. We both enjoyed the game and want to play it again with a team of four. My friend even talked over the game we played with his daughter who came up with a house rule she thought would be fun. The rules use the concept of action taking place like in a movie, when the camera is on you. Her suggestion is when you are taking your turn you have to narrate the action, like it was a movie. 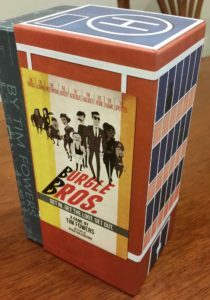 Burgle Bros. is designed by Tim Fowers (and self-published) with art by Ryan Goldsberry. The game is for 1–4 players and should last 45–90 minutes. There isn’t a suggested age listed, but based on the cooperative nature and unexpected turns I would suggest 12+. Thanks to Tim Fowers for a review copy of the game.